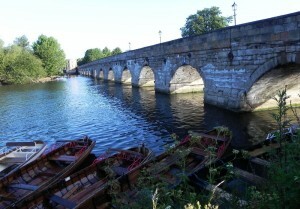 A new walking guide to Stratford-upon Avon for smartphones has just been launched by the author of The Shakespeare blog. Shakespeare’s Stratford-upon-Avon has been developed in collaboration with the Hungarian company Pocket Guide which creates walking guide apps for cities around the world. By linking stories about real people and places with quotations from the plays it shows how Shakespeare brought his memories of the town and the Warwickshire countryside into his work. It also shows how he is commemorated in Stratford. Once you’ve downloaded the app you make your way to the start of the walk and my voice guides you round the town. It’s a really convenient way of finding out about Shakespeare’s Stratford for those who don’t have time for a town tour, or indeed for people who can’t visit the town at all but are interested in its Shakespeare connections. The app uses the phone’s GPS system so you don’t have to keep stopping to read a guide book or consult a map, though the onscreen map always shows you where you are, and the commentary can also be read on the phone. You can stop half way round for a break, and you can even access it from home to listen again and look at the dozens of original photos that come with the tour. Here’s a sample of one of the commentaries, from The Dell next to Holy Trinity Church. The app is available for both the Apple and Android systems and can be found via the Pocket Guide website. Really enjoyed your blog about the Shakespeare App. We hope you will come on our Walking Tour with William Shakespeare (started in 2011), which we also hope you will enjoy equally – lots of walking and in the company of the great man himself! Thank you for your comments, I hope you are getting lots of people enjoying your Walking Tours!